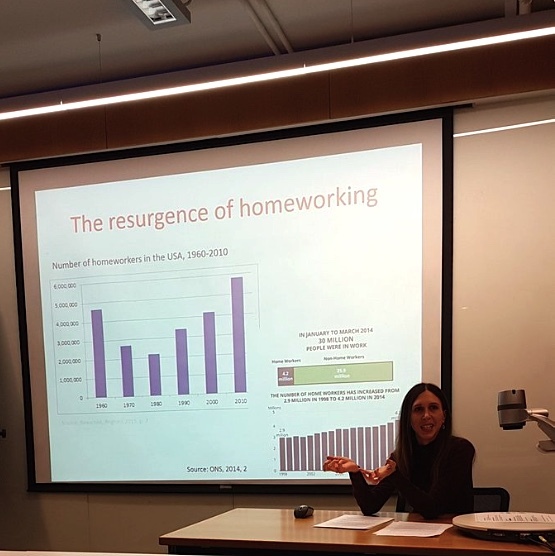 On February 25th, Annabelle Wilkins presented her research on homeworking and coworking at a seminar hosted by the Research Group on Collaborative Spaces (RGCS). The presentation took place at Cass Business School, and the audience included practitioners and academics interested in collaborative spaces, organisational studies, management and economic geography. During the seminar, Annabelle positioned coworking in relation to broader increases in homeworking and freelance work, as well as linking the research with literature on coworking, innovation and economic diversity in cities. She discussed some of her key findings on different models of home-based coworking, highlighting the social and economic motivations of the Cohome and Hoffice networks and the importance of the neighbourhood in developing coworking communities. Discussions after the presentation provided helpful suggestions on how to theorise coworking in relation to freelance work – particularly in terms of space-time relationships, the ways in which workers navigate between different work spaces and communities (digitally and physically located) and how coworking might help people to manage transitions in their work and life. The slides from the presentation are available here.